The Roosterfish (Nematistius pectoralis) named “Cassidy” (Tag ID: GFR9202) was originally tagged & released by angler Joe Caliri on February 25th, 2016 while fishing with Captain Mike Alligood and mate Mariano aboard the charter boat Epic. The Epic fishes out of the Gray FishTag Official Research Center, Los Sueños Resort & Marina in Playa Herradura, Costa Rica (https://www.lossuenos.com/marina/). The Roosterfish was measured to be 60 inches (124.46 cm) total length and had an approximate weight of 50 pounds. Incredibly one year later, 368 days to be exact, on February 27th, 2017 that same Roosterfish “Cassidy” was recaptured by the same boat crew that tagged it in the first place, Captain Mike Alligood and mate Mariano on the Epic out of the Los Sueños Resort & Marina. 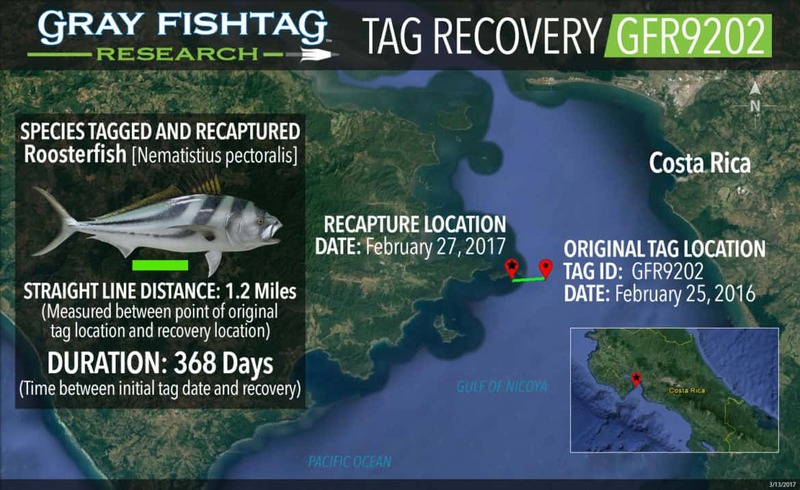 The recapture was in the coastal waters near the Isla Negritos in the Gulf of Nicoya, approximately 1.2 miles away from the original tag location. During that 368-day time period, the Roosterfish most likely stayed in the coastal waters of Costa Rica. The Negritos Islands, where the Roosterfish was tagged and recaptured, is a famous fishing spot that has known to hold a multitude of fish species. That location holds such a diversity of fish due to the unique physical and geographic conditions. There are several underwater rock formations and the water depth changes rapidly from 220 ft to 30 ft which causes some riptides. That area is also where the Gulf of Nicoya water currents meet up with the open ocean. Those conditions are ideal for bait fish and where there are bait fish, there are predator fish feeding. At the time of recapture, the Roosterfish had an estimated length of 62 inches and weight of 55 pounds. Based on the length measurements, this Roosterfish was a mature fish. After the tag information was recorded, the Roosterfish was subsequently released healthy and unharmed. Roosterfish are bluish gray in color with four dark bands, the first located around the eyes, the second on the rear of the head, and last two bands curve and run along their sides. Brownish to blue/gray on their dorsal side, with silvery sides and a white bottom side. Their first dorsal fin is very elongated with seven spines (i.e. Rooster). The Roosterfish is a schooling fish that inhabits mostly nearshore coastal waters with sandy or rocky bottoms. Not much is known about the biology of the fish. Roosterfish are a highly prized recreational sportfish species. They are characterized by their strong and intense fight. GFR Cool Facts: This is the second Roosterfish that Captain Mike Alligood and the charter boat Epic have originally tagged and then gone on to recapture it later. The Epic charter boat crew will receive some Gray FishTag gear for their tagging efforts. The tag recovery angler, Thomas Jones, will receive a pair of Costa Del Mar sunglasses, a Tag & Recovery Certificate, and Gray FishTag gear for reporting the tag recovery.